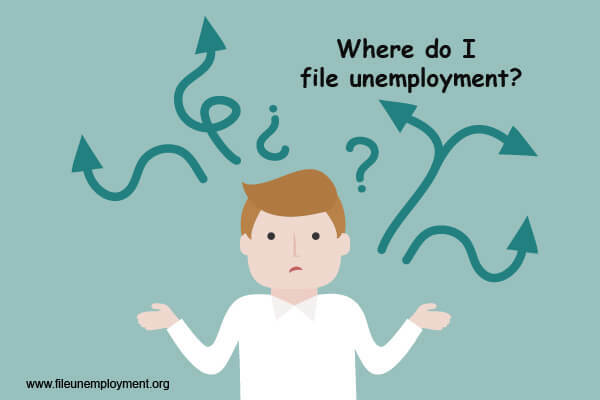 Where to File Unemployment ? Place of Living or Work? Just like most of the developed countries that hand hold its citizens by way of social security benefits for the jobless, the U.S is known to administer an efficient federal-state system that guarantees weekly unemployment benefits for those who’ve lost their job due to involuntary reasons such as layoffs. Foreseen by the U.S Department of Labor and run by each state on its own, the Unemployment Insurance(UI) program hands out up to 26 weeks of monetary compensation on the basis of wages earned in the last 4 to 5 calendar quarters(depending on the state). The claimant who has lost their job due to no fault of their own is required to initiate the claims process by approaching the Unemployment Office(attached to the department of labor) in their state either by phone or via the internet. The filing procedure is more or less similar in all the states. After scrutiny and approval of your initial claim, continue filing on a weekly basis on designated days to ensure timely credit. One of the most common questions our Q & A section receives is pertaining to where to file. State where the employment is based or state where the claimant lives. The answer is quite straightforward. One must be filing from the state of employment since the employer pays unemployment taxes into the state’s system where they operate. If you’re someone whose place of work and residence are different, read the following sections to help you understand how it all works. This is perhaps the most comprehensive and commonly used term in the world of Unemployment Compensation. Let’s understand what this means and how it impacts your eligibility to draw benefits. It is 4(earliest) of the last 5 calendar quarters completed of a calendar year. For instance, if you’re applying for UI benefits in Feb 2015, the base period, in this case, will be October 1, 2013, to September 30, 2014. Wages earned during this period is considered to ascertain if you qualify and also to determine WBA(Weekly Benefit Amount). Those who do not have the sufficient earnings of worked hours during the base period can use the Alternate Base Period which just takes into account, last four calendar quarters only. This term is used to denote a situation where the claimant has worked in State A through out the base period but has moved to State B to seek further employment or make a living. The claimant can go ahead and file from State A and also fulfill the eligibility criteria laid down in the state. After approval, the claimant can continue filing for benefits from the state of last employment and fulfill the requirements either until the time the benefits exhaust or they find a job. This phrase is used to represent a situation where the claimant has worked in more than one state during the base period. He/she can file from any of the states where they worked and initiate a combined wage claim where the credentials are verified by all the states before being approved. Once the WBA and others aspects are determined, the claimant can continue filing for weekly benefits either over the phone or by the internet. Some states encourage jobless workers to apply from their state if the claimant lives around the border and travels to the state of claim during the base period for employment. If the worker is looking forward to seeking jobs in that state, an interstate claim can be filed. Nearly all states in the U.S provide Unemployment Compensation in cases as described above. Since this program is more or less a state subject, you must understand the nature of benefits before filing. The easiest way to apply and claim UC is the internet. Visit the official website of the unemployment office in your state to file and manage online in a hassle-free manner.